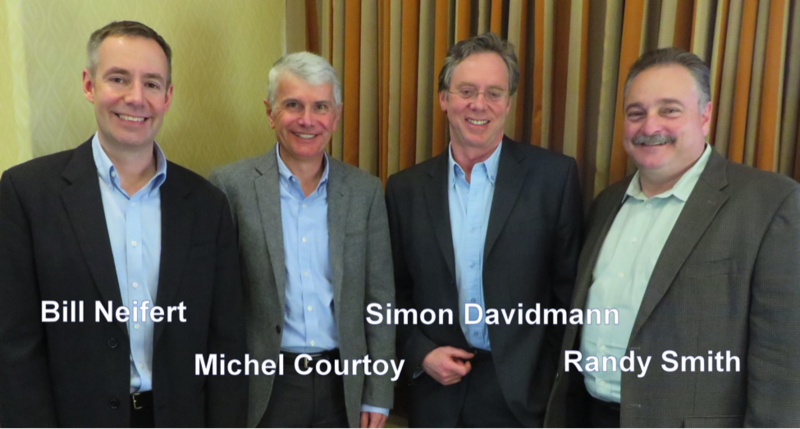 Experts at the Table, part 2: An EDA startup has to create valuable technology, deal with established companies and persuade risk-averse customers. Semiconductor Engineering sat down with Bill Neifert, chief technology officer at Carbon Design Systems; Simon Davidmann, chief executive officer for Imperas Inc.; Randy Smith, vice president of marketing for Sonics and Michel Courtoy, vice president of marketing and business development for Kilopass Technology. In part one, the experts talked about innovation in the EDA industry, the breakdown of the funding model and the areas in which EDA needs to focus and grow. What follows are excerpts of that conversation. SE: Where is the next round of technology breakthroughs likely to happen? Smith: There is room for plenty of breakthroughs above RTL. Using a typical EDA model, the overhead is not large. It only takes a couple of million dollars and a couple of guys who are willing to work hard for less pay for a while. To come up with new IP is a slightly different problem because you have to start by buying design tools. While you can get tools donated through a partner program for integration, if you are trying to build something in silicon, the EDA companies do not want to give those tools away. There is still room for IP breakthroughs, such as in the Internet of Things space. Certain problems are very unsolved, such as low power. We are just not progressing fast enough and we will not get what we need through process changes. Studies have shown that most of the power savings come from the architecture and yet we don’t have a standardized way to work on it. Neifert: There is not even a non-standard way to work on it. System-level power is probably the next area for innovation, just because there is a strong need and there are some home grown approaches that haven’t managed to enter the marketplace yet. That is probably where we will see the next couple of EDA startups. Smith: Right – there is only one right now (Docea Power) and they are not doing a whole lot of business right now. They have existed for quite a while. Neifert: There are a couple in Asia as well. That is what makes it interesting. EDA companies have traditionally been based in the US and a few in Europe. But growth is happening in Asia. That is where a chunk of our growth is so it will be interesting to see if the next generation of EDA companies comes from there – closer to where the design is being done. EDA companies traditionally get started from using internally developed methodologies. SE: A large IP company recently said that EDA is failing them and that they were the ones providing all of the productivity gains while EDA is not providing the tools to help translate that into product. They feel that they may have to take the ball and provide the next level of advancement. Smith: The customer has to be able to tailor a piece of IP to their needs and the IP company is responsible for the tools to do that. Also, it is not possible for an IP company to come up with a generic EDA tool that will work across different types of IP block. There were IP companies building memory compilers back in the 90s, so it is not unusual for IP to be delivered with tools. Tensilica had to do that, we do that. The issue is that you are like a semiconductor company to the tool supplier. You have to use the same tools that your customer would get and you have to work in the same environment that your customers will work in. The reason why system-level design has not progressed as much as predicted is simply because the IP companies delayed the pain. They could overcome complexity by putting more pre-verified pieces of IP on the chip and delayed the pain. As we move into platform-based design, we are delaying the pain again and there is a point at which we would like to see something better and that is moving to higher-levels of abstraction. We are seeing more discussions about what will happen to SystemC, will it do more for us, or have we taken it as far as it will go? These are good discussions to have because we need to understand this before we can build tools. What will the flow look like? Neifert: The issue is that standards are the first step of commoditization. Once you have a standard everyone has to adhere to it and once I have that I can move between anyone and EDA companies are notorious for their sales tactics – one price for everything and then move stuff around to squeeze someone out of the market. Standards enable that behavior. Until the standard exists there is more room for differentiation. Big EDA is often against a standard until they have to be for it. Small companies used to be the ones to push for standards because that was their way in the door. With the lack of EDA startups, there is less push for the standards. Smith: Synopsys used to sponsor an interoperability program. They would invite other companies in. There is still the page for this, but there has not been one since 2011. Courtoy: That is a business decision. It no longer benefits them. Smith: But it is strange that it just died without anyone saying anything. The buying focus of the big semiconductor companies has become: pick one primary vendor and give them a large chunk of my budget and then reserve a little budget to go after the tools I need that are better than the ones from my primary vendor. Neifert: Right. The first step for a startup is to convince the customer that they need something when the primary says they don’t need it. Then they will say they have one in development to delay things and then offer it for free. This makes it a tough hill to climb for an EDA startup. You really have to have something different. Courtoy: The big customers encourage this too. They are risk averse. Why add new tools in the flow unless there is a really significant advantage. Davidmann: I think that to be successful as an EDA company you have to do something that is different, defendable and provides value. It is harder to find those now because of the big flows, but there are still lots of opportunities. You won’t get anywhere trying to build a faster Verilog simulator, but not that long ago there were seven of them. Finding something that is of sufficient value is a challenge unless you are smart about it. SE: How do you make anything in EDA defendable? Smith: EDA tends to rely a lot on trade secret as opposed to patents. This is a part of the problem because people job hop. This is happening at all levels including senior people. Hardly anyone tried to go after trade secret violations. Davidmann: It is hard to find interesting things in an established, consolidated market. You have to concentrate on things that are changing quickly and do things quickly. First mover advantage enables you to get people behind you. Eventually a trend happens and then some companies will become successful and others fall by the wayside. This is the lifecycle. Traditional EDA is done, but there are other things that are changing. Magma and Monterey both grew to $100M. One succeeded and one blew it but it all finished up in Synopsys. Courtoy: I think the last IPO in the industry was Verisity. Davidmann: I don’t know what is happening in terms of EDA research, but I do know that there is so much going on in software. There are over 100 universities using our stuff for real things. Some of it surprises us. We don’t know if any of it will turn into commercial products – some of it could. Will it be valuable? Will I put my money into it – some of it possibly, but most of it no. It is too marginal. I am not sure what would make sense in traditional EDA. We know where the holes are. Smith: I still think the lack of standardization has to be fixed. The above RTL problem is critical and it is difficult to optimize when each part of a system is different. The flow is different. Davidmann: We have two types of customers. There are the ones that just pick up the stuff and they tend to be inexperienced, but the ones who have been in EDA for decades can’t get their heads around it. They are stuck in RTL. In the final part of this roundtable, the panelists will discuss if embedded software is the right area for startups to target. Thanks for the clarification Yatin. It is good to know that such an important program does continue. You might want to mention to the people in charge of the website that it would be helpful if they made such a progression more evident. I did fact check the original statement and there is no mention of its progression on the site.